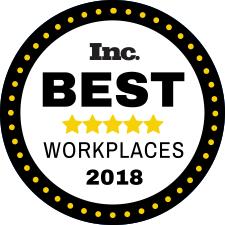 May 2018 - Treeline Named an Inc. Magazine Best Workplace Honoree - Treeline, Inc.
by Inc. Magazine, and rankings will be released later this month. Inc. Magazine partnered with Quantum Workplace to survey companies and assess employee engagement. The survey addressed career development, communication, trust in leadership, team dynamics, and individual needs. Companies were scored based on employee response rate, and Treeline, Inc. was notified that the survey responses were so high that the company is being named an honoree. Treeline, Inc. is the nation’s premier executive sales recruitment firm helping organizations grow their business and build world-class sales teams. Treeline is the developer of its proprietary sales hiring technology helping hiring managers find and hire top sales talent faster and with less cost. For more details regarding Inc.’s 2018 Best Workplaces, visit Inc.’s website here.